If you’ve decided to get back into shape – or to get in shape for the first time – congratulations! You’re among the all-too-small club that has chosen to stand out from the overweight, energy-drained masses that don’t incorporate regular exercise into their daily routines. Regular exercise improves both the body and mind, and is irrefutably linked with longevity, quality of life, confidence and, of course, looking good on the beach. Going to a gym, however, comes with several drawbacks. Even inexpensive gyms add up quickly, they often come with long contract requirements, they’re crowded at peak hours, and just the thought of having to leave the house to go to a gym is often a deterrent from working out at all. Home gyms, however, pay for themselves over time, there’s never anyone there hogging all the good equipment and they leave you no excuse not to “go.” The trick is to pick equipment that serves more than one purpose, while providing versatility and maximum impact to multiple muscle groups. Consider turning your home into a gym with these affordable, space-saving must-haves. Bring the gym to your home with a single, cost-effective piece of equipment. Experts consistently consider gym memberships as among the top fixed monthly expenses that could lead to hundreds of dollars in savings a year. Working out at home not only doesn’t require a costly gym membership, but saves money on gas as well as food or snacks that you’re likely to buy there. With bodyweight workouts alone (pushups, pistol squats, etc. ), a person could quickly and radically transform their physique if they practiced consistently and used their imagination. An investment in a home gym, however, can transform your body without transforming your home – or breaking your budget. Arguably most famous name in fitness equipment – or perhaps even fitness in general – Weider’s entry-level home gym is definitely worth consideration. Coming in under $230 bucks, the 2980 has six different stations for you to migrate between for new exercises on different muscle groups. This gem brings all the credibility of the Weider name with a price tag you’d expect to find on an inferior brand. The 81-pound stacked weights equal up to 214 pounds of resistance. The Gold’s Gym XR45 Home Gym brings 210 pounds of resistance to six unique workout stations – all in a piece of equipment whose vertical design allows for a compact, space-saving shape. The 81-pound weight stack glides along the pulley system, which has no set path. The high-pulley system packs 41 exercises, and the low-pulley option offers 15 unique variations. The lat bar has multiple variations to engage the entire back of the body, and the chest station offers press and fly workouts in one complete station. Sewn vinyl seats, an ankle strap with handle and an instructional exercise poster make this single purchase a complete home gym in and of itself. Although more expensive than the Gold’s Gym home gym, the Bowflex Xceed Home Gym may be the best dollar value of any home gym made in this price range. With a lat tower, squat station, leg attachment, ab crunch attachment, lumbar support and adjustable pulley system, the Xceed brings more than 65 gym-quality exercises to the comfort of any room in your house. Adjustable, customizable power rods, which are unique to Bowlflex, provide resistance on both the positive and negative ends of each repetition. A lat tower, upper and lower pulley station, as well as 210 pounds of resistance without any weights make this the only home gym you may ever need. There isn’t a credible martial artist who doesn’t incorporate chinups and pullups into their workout regimen. There is simply no exercise on Earth that develops the back, biceps, lats, forearms, shoulders and grip strength like pullups and chinups, and the Door Gym by Creative Fitness is the solution for any home gym – literally. With no installation required, it fits inside any standard doorway without bolts or brackets. Multiple grip options allow for palms in, palms out and palms facing each other, along with wide, standard and close-grip options, as well as behind-the-neck chinups. The Door Gym pulls double duty on the floor by enhancing pushups and crunches while providing a dip station. Cheap and brutally effective, the Door Gym takes up almost no space and performs multiple functions – key elements in any home-gym equipment. With a great sticker price and construction that was designed with durability in mind, the Marcy home gym is everything a home gym should be. compact, sleek and versatile, the Marcy home gym has a preacher curl station, a tempered lat bar and leg curl station. The 14-gauge steel is protected by a warranty, and the 150-lb vinyl-coated weight stack is protected by a weight cover. It would be difficult to find an exercise in the gym that couldn’t be duplicated with the Marcy home gym. It doesn’t require extraordinary resources – or even a gym membership – to get in peak physical condition. 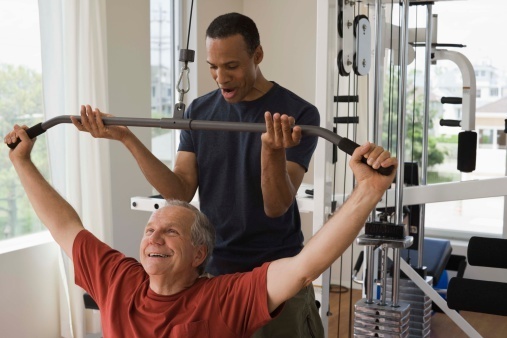 The initial investment in gym equipment can pay for itself many times over in the years – or even months – to come. Aside from the convenience of not having to leave home, home gyms provide privacy, customizability and versatility. Combining many exercises into a single piece of equipment allows the practitioner to enjoy comprehensive workouts without ever leaving the comfort of home. Andrew Lisa is a freelance writer living in Los Angeles. He writes about home fitness and personal finance. I agree with the idea. However it may come into a point where one gets too lazy to workout. I guess it’s all about how dedicated we are in everything we do. Cheers!